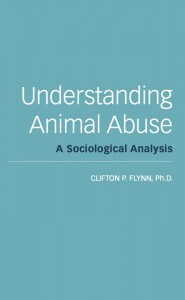 Centre Fellow Professor Clifton P. Flynn has published a new sociological analysis of animal abuse. Understanding Animal Abuse: A Sociological Analysis, published by Lantern Books, examines animal cruelty as a social phenomenon, identifying social and cultural factors that help explain its occurrence. It covers the connections between animal abuse and human violence and other antisocial behaviours, and carefully analyzes the research on the “link” – the hypothesis that individuals, typically children, graduate from childhood animal cruelty to subsequent violence against humans. The book includes recommendations for policy and professionals, as well as suggestions for future research. Ultimately, Dr Flynn challenges the reader to move beyond notions of animal abuse limited to harmful acts committed by individuals, arguing that we must include the systemic and institutionalised forms of cruelty, like factory farming and animal experimentation, as well. Understanding Animal Abuse is accessible and affordable, and would be an excellent text for a course on animal abuse, or a supplementary text for a broader course in human-animal studies. It could also serve as a valuable resource for scholars and graduate students, as well as professionals working in fields dealing with animal abuse – policy makers, judges, prosecutors, social workers, clinicians, educators, those who work with battered women, veterinarians, and others. For more information about the book, see here. The first chapter is available here. Dr Clifton P. Flynn is Professor of Sociology and Chair, Department of Sociology, Criminal Justice, and Women’s Studies at the University of South Carolina Upstate. He is also the editor of Social Creatures: A Human and Animal Studies Reader (Lantern Books, 2008), one of the first anthologies in human-animal studies.